An important contributor to the development of rock and roll in the 1970s, Mick Ronson was raised in the Yorkshire community of Hull, where the shy youth soon immersed himself in the creation of music. During his school years he established a solid foundation for his future career by learning piano, recorder and violin (with some harmonium playing for his local church thrown in for good measure), and although his initial ambition was to become a cellist, by he teens he (not surprisingly) was drawn instead to the guitar - inspired in particular by the playing style of then-Yardbird Jeff Beck. Ronson joined his first band The Mariners at the age of 17, and it was not long before he was drafted into the more experienced line-up of The Crestas, with whom he began to build a strong reputation within the Hull music scene. His tenure with The Crestas ended in the latter half of 1965, when he made the decision to seek his fortune in London; brief tenures in The Voice (an outfit managed by the leaders of 'The Process' cult) and the Motown-oriented group The Wanted followed in 1966 before financial difficulties forced the guitarist to return home. Back in Hull, Ronson was enlisted into the second incarnation of the local group The Rats, once again establishing himself as one of the top musicians in the area. He recorded a trio of singles and an album (The Rise and Fall of Bernie Gripplestone (1967)) with the band before making another attempt at London in 1968; this second move was met with a similar lack of success, and after only one week its members once again returned to Hull. The Rats then briefly became Treacle, before reverting back to their original name and then ceasing to exist in 1969. Near the end of his tenure with the band, Ronson was brought into the studio to add his playing to the Michael Chapman album Fully Qualified Survivor (1970), where he was given his first introduction to producer/musician Tony Visconti. By the start of the following year they were once again working together in the David Bowie-fronted band The Hype: Ronson's name had been put forward by his former Rats bandmate John Cambridge, and after a successful audition in London the guitarist found himself performing with Cambridge, Visconti and Bowie on John Peel's Sunday Show. The Hype proved to be a short-lived ensemble, with Cambridge being replaced after only a couple of months by another former Rat, drummer Woody Woodmansey; it was this line-up that Bowie made use of for his 1971 album The Man Who Sold the World. After the completion of the album, Ronson and Woodmansey (augmented by vocalist Benny Marshall and bassist Trevor Bolder) continued independently of Bowie as Ronno, releasing one unsuccessful single (The Fourth Hour of My Sleep (1971)) before dissolving. Ronson continued to work with Bowie for three more years, his skills as a musician (and as an arranger, as is demonstrated on the popular single Changes) contributing much to the singer's next four offerings: Hunky Dory (1971), Aladdin Sane (1973), Pin-Ups (1973) and especially The Rise And Fall of Ziggy Stardust And The Spiders From Mars (1972) (an album for which he handled most of the guitar and keyboard parts, as well as many of the arrangements). In the decades to follow, it was this period of Ronson's activity that would have the most impact on both music listeners and musicians. Outside of a impromptu guest appearance at the Toronto stop of the Serious Moonlight Tour in 1983 (performing The Jean Genie), only once more in his lifetime did he resume his professional association with Bowie, adding guitar to a cover of the Cream song I Feel Free on the 1993 release Black Tie White Noise. Concurrent to their work together, both Bowie and Ronson were involved in popular albums by Lou Reed (Transformer (1972)) and Mott the Hoople (All The Young Dudes (also 1972)) - the latter project initiating a second significant collaborative relationship for Ronson, this time with Hoople frontman Ian Hunter. 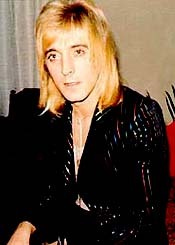 In 1974 Hunter brought the guitarist into the band to replace a departing Mick Ralphs, but soon afterwards Mott the Hoople reached the end of its lifespan; that same year Ronson released his first solo album, Slaughter on 10th Avenue, recorded with sometime Frank Zappa drummer Aynsley Dunbar and fellow former Spider From Mars Trevor Bolder. He then brought his various talents to bear on Hunter's eponymous 1975 debut, serving as both producer and arranger for the sessions in addition to his extensive instrumental duties. This same approach was taken for his own second solo effort Play Don't Worry (1975). From the mid-70s into the early 1980s Ronson remained active with a variety of different artists, not infrequently acting in the capacity of both producer and guest performer. In 1975 Bob Dylan invited him to be part of his 'Rolling Thunder Revue', and two extensive tours with Hunter were undertaken - the first also taking place in '75 and the second in '79. In addition to his involvement in Hunter's next five solo releases, he appeared on records by Roger McGuinn, John Cougar Mellencamp (still using 'Johnny Cougar' at the time), Bob Dylan, Annette Peacock, David Johansen, Meat Loaf, old cohort Michael Chapman, and quite a few others. His output lessened somewhat as the 80s wore on, but, despite a cancer diagnosis in 1990, he continued to work with both long-time collaborators (teaming up once again with Ian Hunter for his 1990 album Y. U. I. Orta) and a new generation of musicians influenced by his earlier output ([producing Morrissey's Your Arsenal (1992) and adding guitar to The Wildhearts' Earth vs. the Wildhearts 1993)). The cancer finally claimed his life in April of 1993. His third solo album Heaven and Hull, unfinished at the time of his death, was completed and posthumously released in 1994, and featured input numerous guest performers; a tribute concert for the guitarist was staged that same year.